Lindal Group plans to unveil the design and development of its pharma devices at this month’s CPhl exhibition in Frankfurt, Germany. The Germany-based aerosol packaging specialist manufactures pharma metering valves for a broad range of applications. One of the pharma metering valves the company will highlight at the German fair is the KHFA valve which it ays has been designed for chlorofluorocarbons-free formulation with the HFA being environmentally friendly. 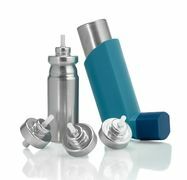 According to the Germany-based aerosol packaging manufacturer, the KHFA valve has been successfully used on suspension, solution and hybrid formulations. Thereby, it has delivered performance that caters to the most demanding international specifications, claims Lindal. The valve is said to be compatible with a wide variety of formulations and comes with a clean extractable profile. Owing to its rapid fill/rapid drain technology, there is no priming needed with the valve, stated the German firm. Lindal’s inventory of pharma products comprises Bag on Valves (BoV) and the Pinocchio actuator for nasal applications. The company says that its aerosol solutions can be implemented for pulmonary, topical, nasal, and rectal delivery. Lindal Group expert and technical sales manager Gabriele Marchetti said: “Aerosol technology is employed on various drug delivery systems that allows the transport of the medication in exact location in the body: Pulmonary, nasal and topical deliveries can be achieved by means of aerosol technology, since pressurized packs can generate fine particles able to reach the lungs, micronized or streamed fluids to irrigate the nose and foams or gels for skin absorption. Image: Lindal will showcase its products for the pharma industry at CPhl. Photo: courtesy of LINDAL Group.